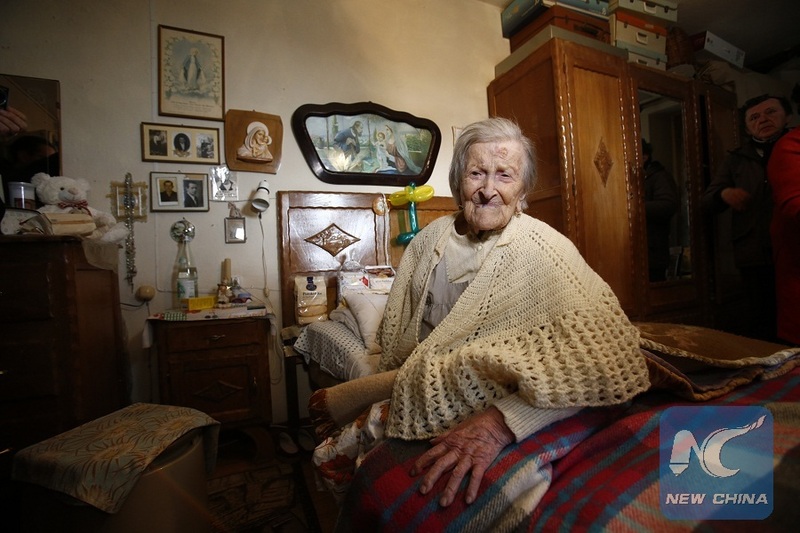 ROME, April 15 (Xinhua) -- The known oldest living person, Italian woman Emma Morano, died at 117 in her home in Northern Italy on Saturday. Born on Nov. 29, 1899, Morano became the last survivor who was born in the 19th century. Silvia Marchionini, mayor of her hometown Verbania, said Morano had an amazing life and "we will always remember her strength going forward." During her life, Morano had witnessed three Italian kings and lived through a dozen different presidents. Despite such surprising longevity, her life has not been easy at all. She outlived all of her family members, namely eight brothers and sisters. She lost a boyfriend in the First World War, and then married a quite abusive man, whom she did not love, according to local media. Morano lost her only child, not long before leaving her brutal husband. Since then, she supported herself, lived alone, and worked in a factory until the age of 65. However, the most surprising note in her life is perhaps, considering the longevity, her diet: three eggs a day up to some 10 years ago.